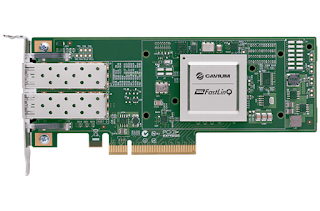 Cavium announced the introduction of the FastLinQ 41000 Series products, its low power, second generation 10/25/40/50 Gigabit Ethernet NIC that is claimed to be the only such adapter to feature Universal RDMA. 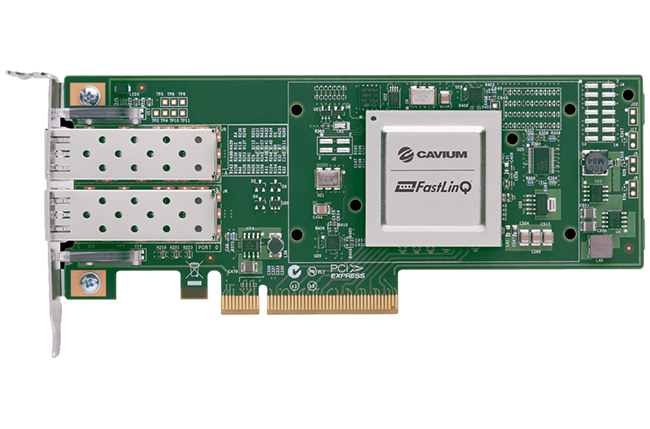 Cavium's FastLinQ 41000 Series devices are designed to deliver advanced networking for cloud and telco architectures; the products are available immediately from Cavium and shortly due to be available from Tier-1 OEMs/ODMs in standard, mezzanine, LOM and OCP form factors. The FastLinQ QL41000 family of standards-compliant 25/50 Gigabit Ethernet NICs offer support for concurrent RoCE, RoCEv2 and iWARP - Universal RDMA. The FastLinQ adapters, coupled with server and networking platforms, are designed to enable enterprise data centres to optimise infrastructure costs and increase virtual machine density leveraging technologies such as concurrent SR-IOV and NIC Partitioning (NPAR) that provide acceleration and QoS for tenant workloads and infrastructure traffic. The new FastLinQ adapters also support network function virtualisation with enhanced small packet performance via integration into DPDK and OpenStack, enabling cloud and telcos/NFV customers to deploy, manage and accelerate demanding artificial intelligence, big data, CDN and machine learning workloads. For telco and NFV applications, the products provide improved small packet performance with line rate packets per second for 10/25 Gigabit Ethernet, MPLSoUDP offload and integration with DPDK and OpenStack using the Mirantis FUEL plug-in. This allows telco's and NFV application vendors to deploy, manage and accelerate demanding NFV workloads. Additionally, integrated storage acceleration and offloads such as NVMe-oF, NVMe-Direct, iSCSI, iSER and FCoE enable upgrades from existing storage paradigms to next generation NVMe and persistent memory semantics. The products also offer zero-touch automatic speed and FEC selection via Cavium's FastLinQ SmartAN technology, which is designed to significantly reduce interoperability challenges in physical layer networks. 1. 10/25/40/50 Gigabit Ethernet connectivity across standard and OCP form factors. 2. Stateless offloads for VxLAN, NVGRE and GENEVE. 3. SmartAN to provide seamless 10/25 Gigabit Ethernet interoperability. 4. Storage protocol offloads for iSCSI, FCoE, iSER, NVMe-oF and SMB Direct. 5. Management across heterogeneous platforms with QConvergeConsole GUI and CLI. Regarding the new products, Martin Hull, senior director product management at Arista Networks, said, "Arista… has partnered with Cavium to ensure availability of tested and interoperable solutions for hyperscale data centres… Cavium's FastLinQ 41000 Series of NICs and Arista’s portfolio of 25 Gbit/s leaf and spine systems deliver backward compatibility and investment protection with standards compliance".